WheelTurner Ambassador Kaimana pinto attended the race and gathered footage from the locals to document the intensity of the event. The semi final round of the top six riders from the Big Island Flow Fest was up in the air and everybody wanted it bad. Follow them through the race course at speeds of 50 mph+ ! 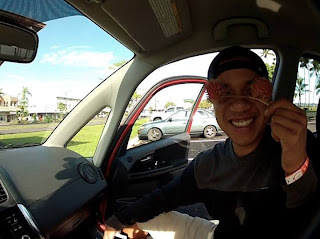 Here are the images Jeff CJ KANG Khau captured during his trip to the Big Island for the Hawaii Winter Outlaw Series event 2.
the island that is big from jeff on Vimeo. 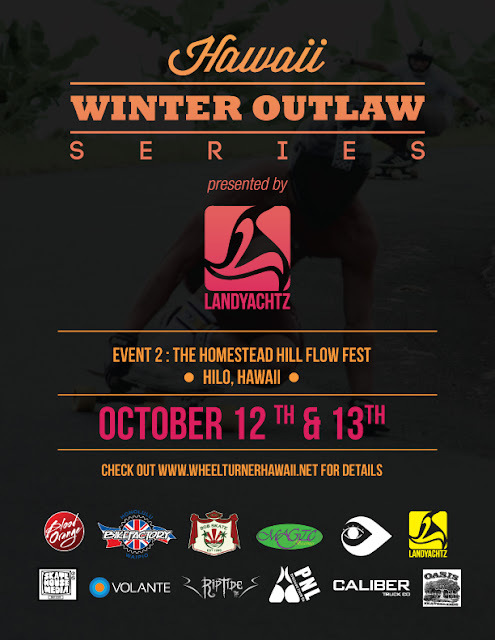 HawaiiWinterOutlawSeries Event 2- The Big Island Flow Fest. 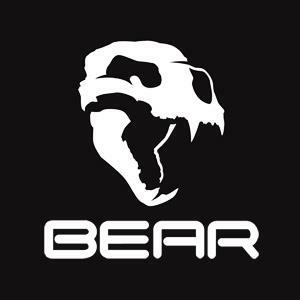 Write Up, Photos and Results. 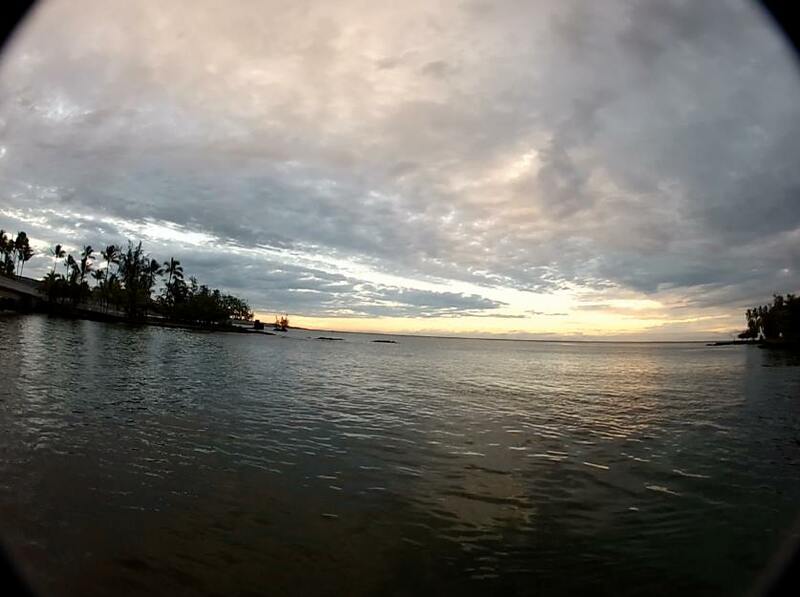 Rain or shine, sun or snow, waves or asphalt, it doesn’t matter what you are looking for, the Big Island has it all. With the entire island being one giant mountain, there are bound to be huge hills wherever the eye can see. 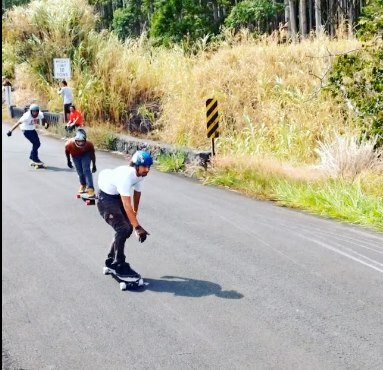 And on one of these very hills was held the Hawai’i Winter Outlaw Series event 2. The weather was perfect. The sun was shining and there was no rain to be had. The road was crispy dry and buttery smooth. Early in the morning the guys were on the hill taking practice runs. Due to inexperience as an event organizer, Brian hadn’t forbidden practice runs the day of the race. Everyone else was lined up at the dope camp zone, Kole Kole, to hear the rules and find out their heats. As Brian explained the rules and drew the heats everyone knew this day was going to be crazy! 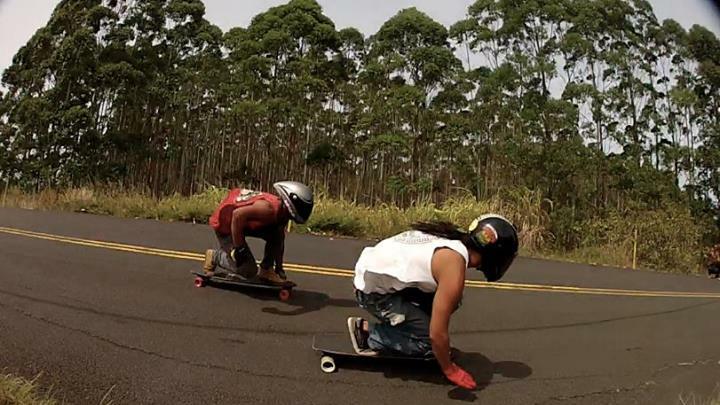 The heats were stacked; with some of the fastest guys from each island racing each other. With the brackets drawn, the rules laid out and everything set, it was time to head up the hill and get the party started. But alas, as the final cars were leaving the campsite to the race hill, the cops rolled up because someone called about some skaters. BLOWN!!! The cops were cruise and didn’t cause any trouble, but the racers had to find another hill to race on, or postpone till the following day. With the rider consensus being that we postpone til the following day, it was a day of free skating for the entire group. With so many runs within driving distance it was going to be a great day after all. But a surprise was in store for everyone. 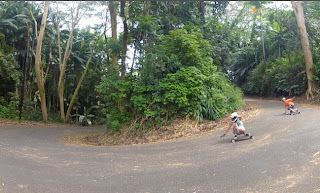 Just about 30 minutes away from the Homestead, there was an untouched gem with 40-50 mph speeds and tight corners. As the group rolled up the hill, tensions were high. 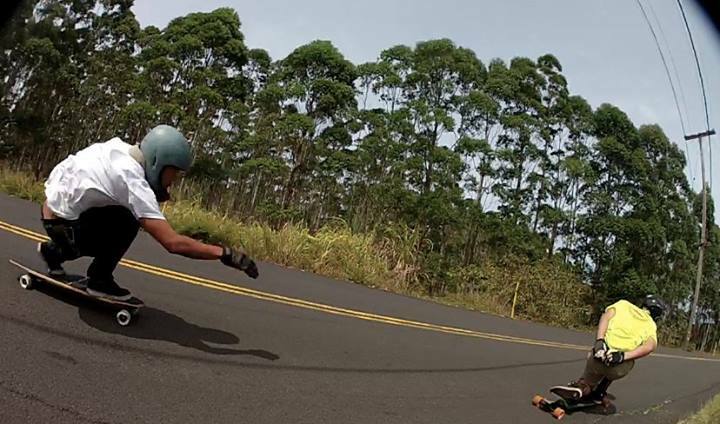 This road was gnarly. After one practice run down the course everyone agreed this would be the hill for the race. With people set up on corners and some very helpful volunteers holding down the one lane bridge that the race ended on, the last practice run was under way. After the practice runs there was a small racers meeting where new rules were laid out. Crossing the double yellow line meant disqualification. If the spotters saw a car coming for the one lane bridge they would signal the riders to shut down, at this point we would rerun the heat if the riders were very close, but if there was enough distance the lead racer would be the winner. Brian gave everyone a chance to withdraw from the race since the hill was changed, but every racer stood their ground. It was on! Back on the top of the hill the racers were getting amped. After the practice runs, everyone knew this course was fast and gnarly. Everyone had their game face on for there was only one chance to move on in this single elimination race. With the first round of heats under way the brackets were emptying quick. After the first round of heats were the quarter-finals. Many great racers had been eliminated in the first heat, but this left only tried and true veterans of the course. Through the quarter-finals the pack of racers was getting smaller. In the Semi-finals we had 6 remaining riders, the victors of these heats would move on to the finals and the defeated would be left to race for consolation prizes. In the semi-finals the heats were: Dakota vs. Kaimana, Mike vs. Nick, and Dusty vs. Brody. Every racer in these heats had been putting on a show in their other heats, but pit them against one another and this was going to be a showdown. The semi-finals were on and they were intense! Each racer was giving his all, passing in critical sections or waiting for the last 100 yard dash, these guys had their strategy planned. 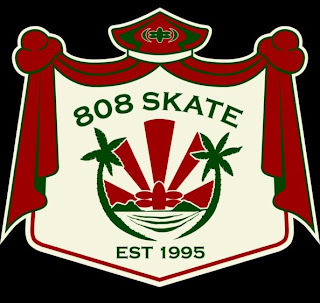 And it paid off, moving into the finals were: the Man from Maui Dakota, the crazy Hawaiian Dusty, and the Oahu O.G. Nick. Crazy thing about the finals heat was that there was one representative from each island. 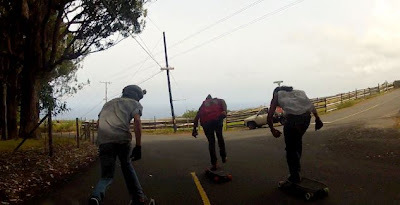 In the consi race were: Mike, Brody, and Kaimana. Since there were 3 racers in the finals and the consi’s, we had no choice but to hold 3 man heats. Each rider had to be at the top of their game to come out on top of these heats. The course was gnarly enough with 2 man heats, but these guys just weren’t any racers, they were finalists. And they proved their merit. The finals were off, Dakota pushing into first with Nick close behind and Dusty trailing. This heat was off to a great start. Through a few turns Dusty was battling with Nick for the pass while Dakota held his lead. Dusty found the line and got past Nick and was barreling down on Dakota, but Dakota wasn’t having it, hanging onto the lead Dakota came flying through the last few corners with a sizeable lead. Nick was trying to get back out front but there just wasn’t enough distance left to catch Dusty and make the pass. So the epic battle for podium spot ended with Dakota being 1st, Dusty earning 2nd, and Nick taking 3rd. This was one heat you had to watch to understand the intenseness. In the consi heat it was Kaimana in 4th, Mike in 5th, and Brody in 6th. What a day of racing! It was time though, to hand out the great prizes that our generous sponsors hooked us up with. But at the finish line there just wasn’t enough room, so we decided to head back down the hill to a large grass field close by. 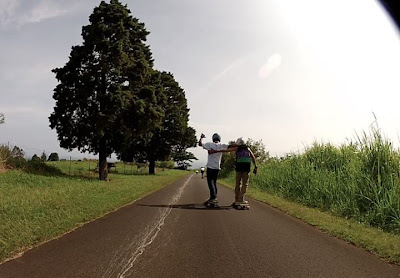 Since it was downhill and the road was nice, all the riders decided it was time to skate down. Down everyone went pack running it to the bottom, and just in time. There were the police for round 2! But again they didn’t want to cause trouble, and when they found out that we were finished, they went their merry way. The award ceremony was epic with 1st through 6th receiving a good deal of schwag and cash, with 1st place receiving an additional 100 dollars from Landyachtz. But not only did the racers get prizes but also our very valuable volunteers were given some free schwag as well. This race could not have happened without the work of these wonderful individuals! The riders and organizers would like to give thanks to all of our generous sponsors and wonderful volunteers! Mahalo nui! 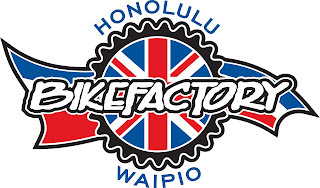 Be sure to make it out to HawaiiWinterOutlawSeries event 3 THE SCORCHER INVITATIONAL. ...This would be one of them. Norge Roadtrip. Dalsnibba descent. from Szymon Bike on Vimeo. Hawaii Winter Outlaw Series event 2. Landyachtz Big Island Flow Fest, SUCCESSFUL! There may have been some slight holdups this morning... but we just put that behind us and had a GREAT day of Hawaiian Skateboard Racing. The course was changed, but all riders were still hyped! 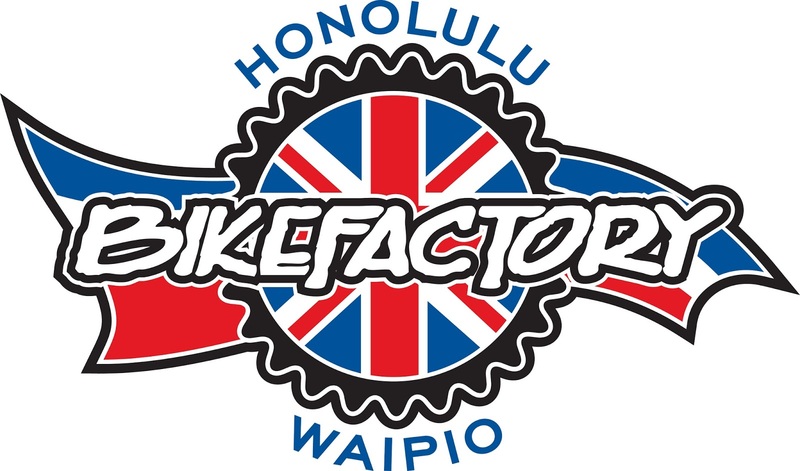 Stoked to see a big mix up of islands in the top 8! Thanks everyone for coming out and making it another successful event. Also a big mahalo to Brian McOuat for helping out and holding it down while I'm out of commission! Brian and the BI crew always bring the good vibes!